6 people went on this hike of ~12 miles: Steve, Mel, Molly, Sophia, and Paul x2. 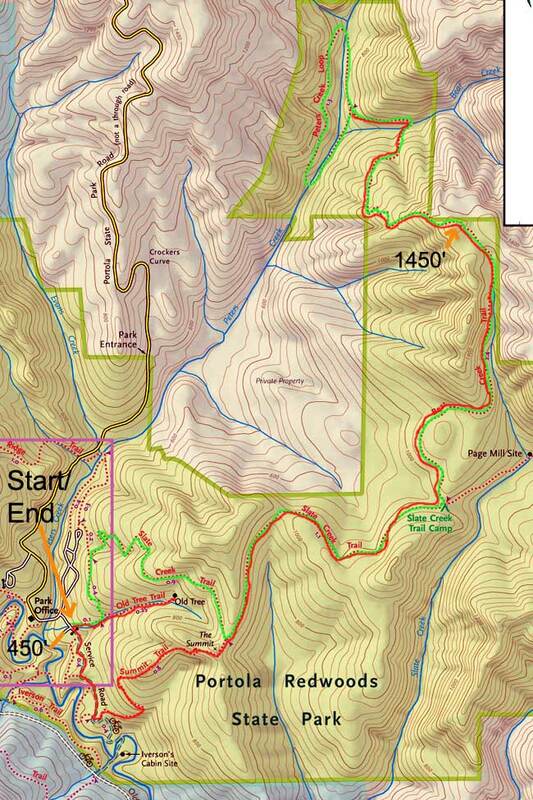 In the map below, the solid green line is the first half of the hike, while the solid red line is the second half. The lowest point of elevation is ~450' while the highest point is ~1450'. Total elevation change of the entire hike is ~1700' for both up and down. The weather was beautiful - mostly sunny and mid 50's to low 60's in temperature. Trail terrain is dense moist second-growth redwood/oak forest with soft footing due to rain the previous days and fallen leaves. Wildlife seen: birds, newt, deer, mushrooms. Pace (including lunch & breaks) ~2.3 mph. Top pace ~3.5 mph. Average non-stop pace: ~3 mph. Calories burned: ~1700 depending on your mass (1700 is for 120lb/5hr hike); click here for calculator. Photos here were taken with Nikon 5700 with tripod and no flash (except 0220180).